Eliminates the need for building inverts, saving time and money. 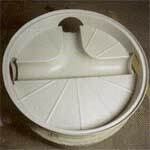 Eliminates inconsistencies associated with manhole base production. Smooth inside surface reduces friction to maximize sewage flow. Contributes to longer-lasting performance without costly jetting and vacuuming costs. Acts as a protective barrier between concrete and hydrogen sulfide gas. Tough polyethylene construction stands up to the harshest conditions. Invert channel available to accommodate in 8', 10' and 12' pipe diameters. Simply give Royal Environmental Systems your project requirements and we will design a system to meet your specifications. Easy application in both drycast and wetcast manufacturing processes. A "must" for new construction projects that need to last. Eliminate inconsistent inverts, reduce costs associated with concrete maintenance and rehab and increase the longevity of your manholes with The Century Manhole® Plastic Invert. Choose state-of-the-art technology that will provide continuous sanitary system quality. Royal Enterprises America, 30622 Forest Blvd., P.O. Box 430, Stacy, MN 55079. Tel: 651-462-2130 ; Fax: 651-462-6990.